Build your own guitar at Spencer Acoustics in Garland, Texas. 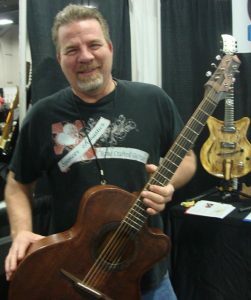 Randy Spencer is a master home builder now building boutique acoustic guitars. Randy’s shop, Spencer Acoustics, is open to experienced builders and novices alike. When I met Randy, I had a rudimentary knowledge of building – I built several skateboard ramps as a kid and work on my own cars. I was no where near qualified to build an acoustic guitar from scratch, so I thought. Perusing Craig’s List for custom guitars and amps, I stumbled upon Randy’s post to “Build your own guitar!” and I thought wow, that’s cool. I did some googling regarding luthier schools in the United States and the nearest is in Nashville, Tennessee and costs 6,000 dollars – tuition and materials only (you still have to pay room and board). Randy charges 40 dollars per class and each guitar building class is 3 hours long. That is cheap!! Let’s say you don’t know how to change your own guitar strings for example, go to Randy’s for one class and you will have that guitar knowledge for a lifetime. You cannot find a better guitar building teacher in the North Texas area. 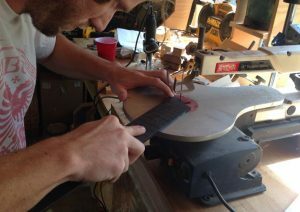 Randy’s guitar building classes are tailored specifically to the individual and their guitar build needs. Randy does not use a lecture format; instead, he works one-on-one with the student at their pace. Every class is situational. If you want to spend one class building your acoustic guitar and the next class swapping pickups in your favorite electric, do it! During building classes, Randy explains each step in detail and demonstrates the ‘how to.’ Then, it’s your turn to start building! Randy is always supervising and available throughout the duration of the build class. Classes are only $40, so there is no pressure to rush through your build. Since class is not in lecture format, you can take time off for holidays and not worry about falling behind – build at your own pace. Guitar building classes are available weekly Monday – Saturday. Daytime class times are 10am-1pm and 2pm-5pm Monday thru Saturday – Evening class times M-F are 6pm-9pm. You will make every part of the guitar from scratch! NO KITS ALLOWED! Work at your own pace. Taking time off for holidays etc. will not put you behind. Spencer Acoustics - Custom, one-of-a-kind acoustic guitars. The Kitchen Studios - Legendary Kitchen Recording Studios has been making classic recordings In the heart of Dallas for over 30 years. The Gear Place - The Gear Place music boutique buys, sells and trades fine music equipment - including collector's items, "one-off" custom builds, signature designs, hard-to-find and unique gear. Texas Transdermals - Vitamin patches with clinically proven ingredients. Drift Japan Official Online Store - Japanese drifting motorsport inspired clothing line. Drift hoodies and apparel. Know Your Gear.net - As seen on YouTube. Philip McKnight's personal site covers a wide variety of guitar-centric topics like gear and how to fix with his Live Q&A and DIY Sharpen My Axe series. © Copyright 2018 GuitarMaker.net. All Rights Reserved.